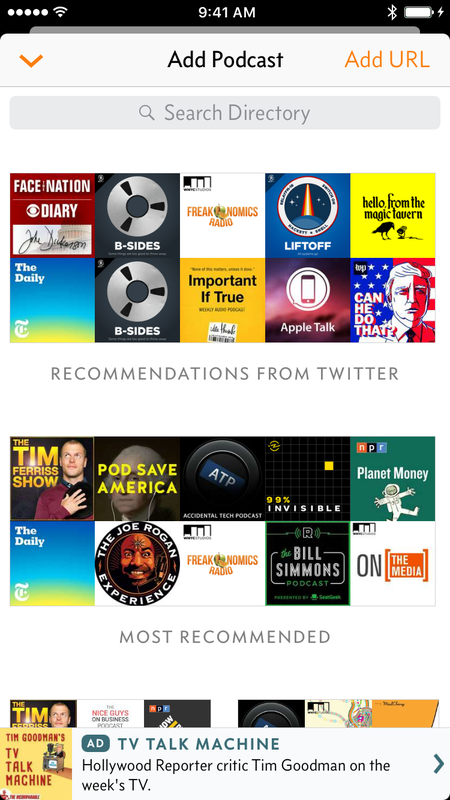 Most popular music and podcast apps have adopted slide-up methods for their Now Playing screens (including the iOS 10 Music app), so this matches what people are already accustomed to elsewhere. 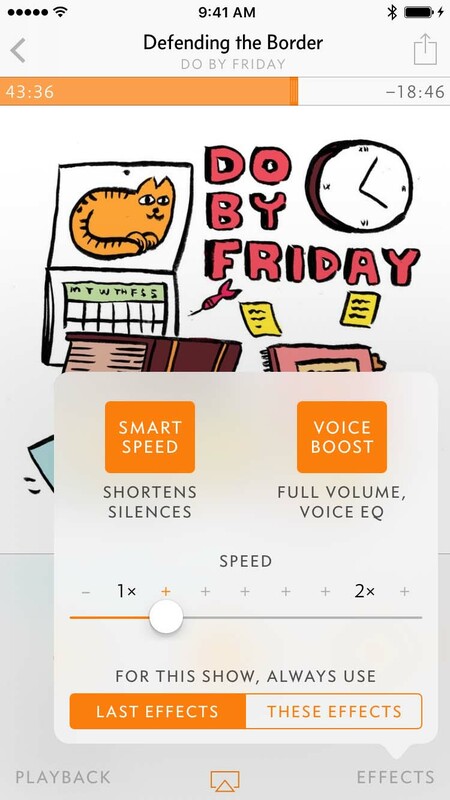 This card metaphor is carried throughout all other modal screens in the app, and they all work the same way, speeding up common tasks and greatly enhancing one-handed use. 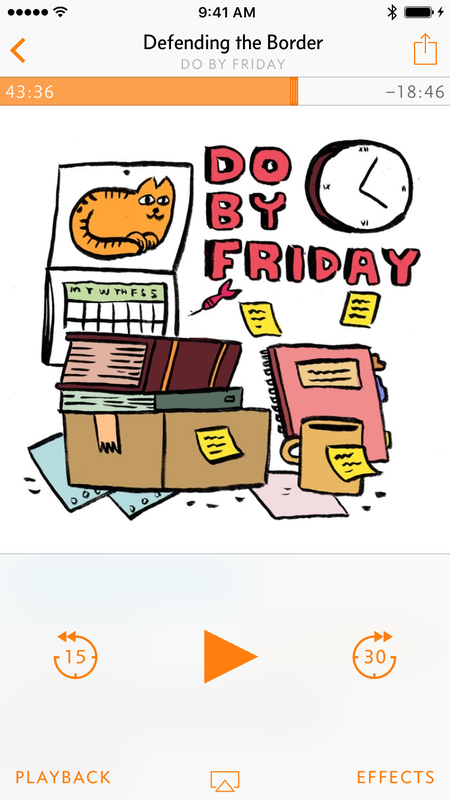 I also redesigned the Now Playing screen itself. 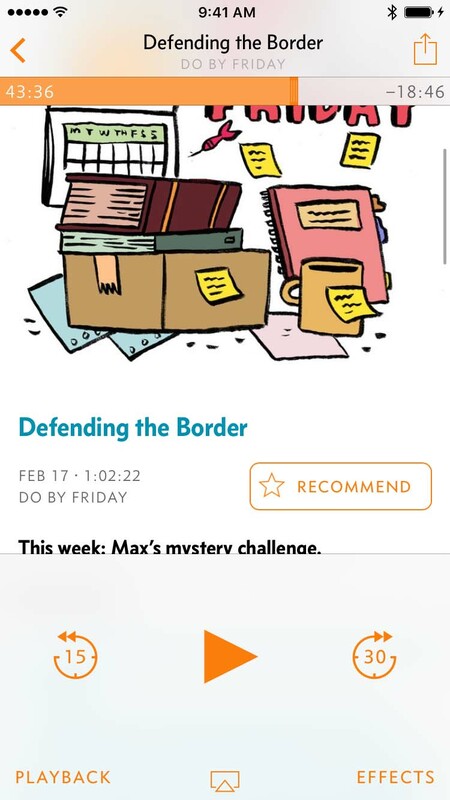 The old one revealed episode notes in a hidden scroll zone — you’d need to swipe up on the artwork to reveal them, which relatively few people ever discovered. Along with a tightening of the seek-back/forward tap zones, this moved critical controls away from the lower-left and lower-right screen edges, which are often mis-tapped when handling large phones. Playlists have been manually reorderable since 1.0, but many iOS users never tap “Edit” buttons in navigation bars, so many people never even knew they could do it. Even for those who knew they could reorder episodes, the two-step process was cumbersome. 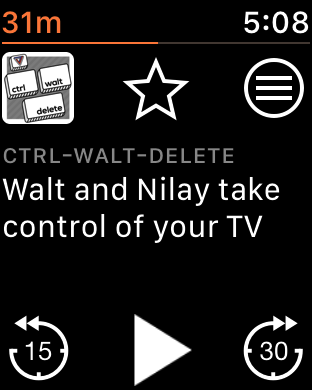 The miniplayer is also now larger and easier to grab, has larger buttons, and hides when nothing is playing. The old popover lacked contrast from its surroundings, had limited space, and required carefully tapping outside its bounds to dismiss, which was often clumsy when one-handed. 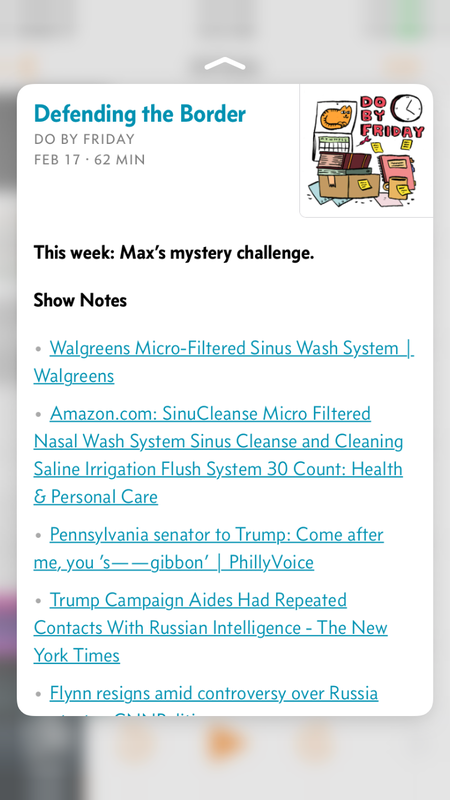 The new episode-info card behaves like all other Overcast 3 cards: slides up quickly, then easily dismissed by swiping down anywhere (or inward from the left edge). It can also be previewed with 3D Touch and swiped up for quick actions. A lot of people also never swipe table cells (or tap Edit buttons), therefore never finding the Delete button. 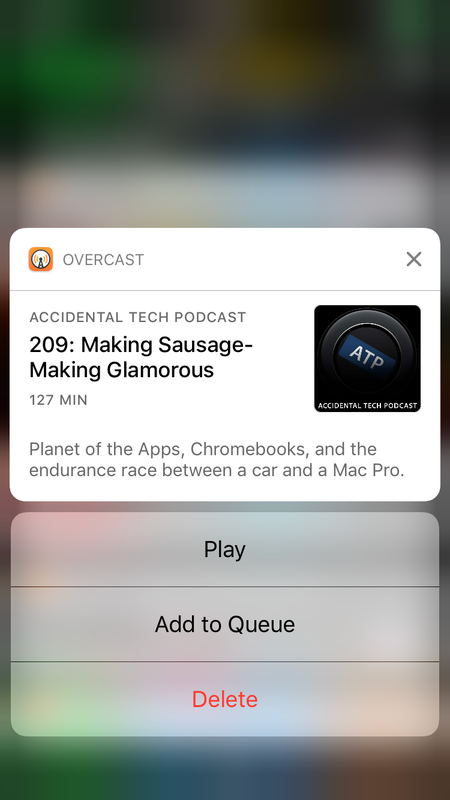 I’ve gotten literally hundreds of emails since Overcast 1.0’s launch asking how to delete episodes without playing them. 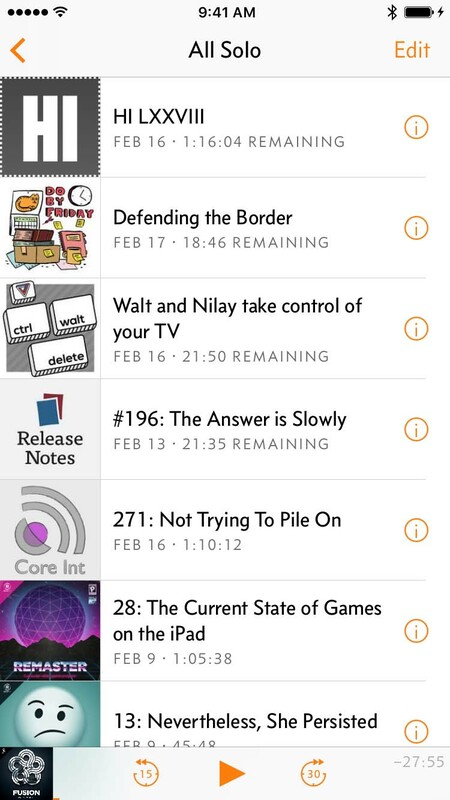 To address these, I’ve switched to a two-stage method: tap an episode to select it, which shows various action buttons, and tap the newly revealed Play button to play it. I expect this to be the most controversial change in Overcast 3, as it does slow down playback, but I’ve found that it works far better and more consistently, most people accustomed to the old way get used to it in a couple of days, and it makes the app far more reliable and discoverable for everyone. It also gave me a place to put a new button: Queue. 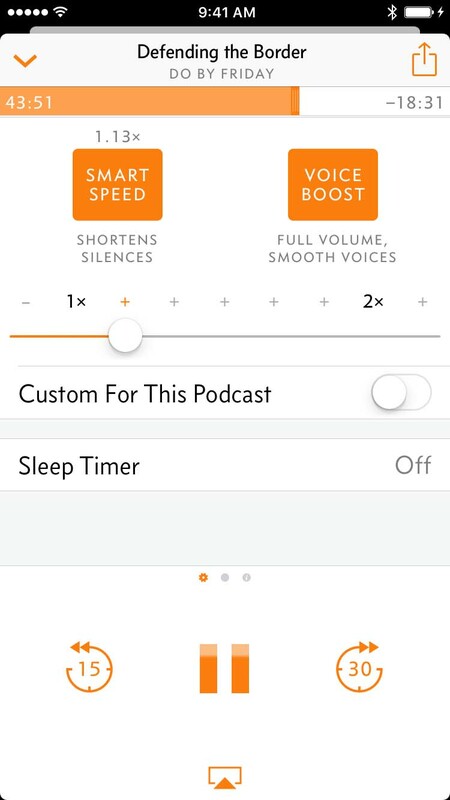 Easy access from around the interface to quickly add episodes to the queue. 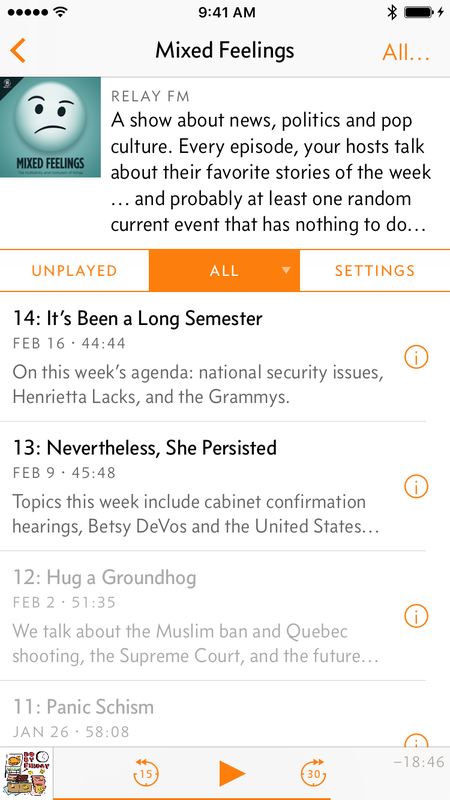 Overcast 3’s new option for manual playlists, instead of just “smart” playlists, matching iTunes’ definitions: manual playlists only ever contain things you add explicitly to them, while “smart” playlists (previously the only kind in Overcast) are a set of rules that automatically include or exclude episodes. Many people want their queue/up-next to be a manual playlist. 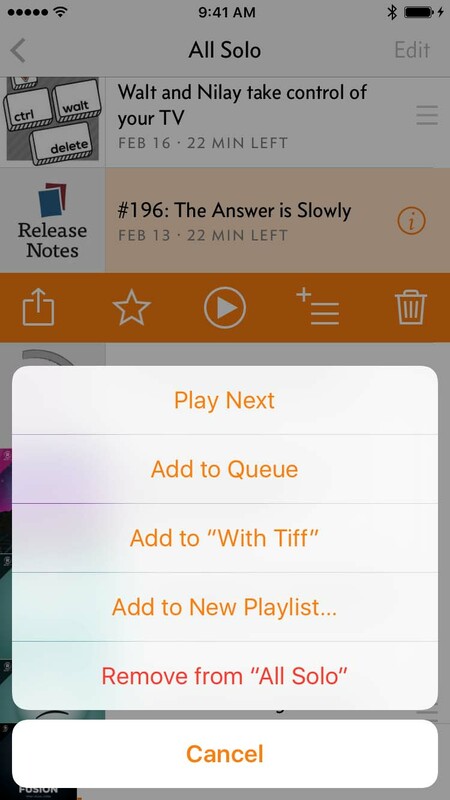 The new queue features are simply Overcast playlists with special placement in the interface. 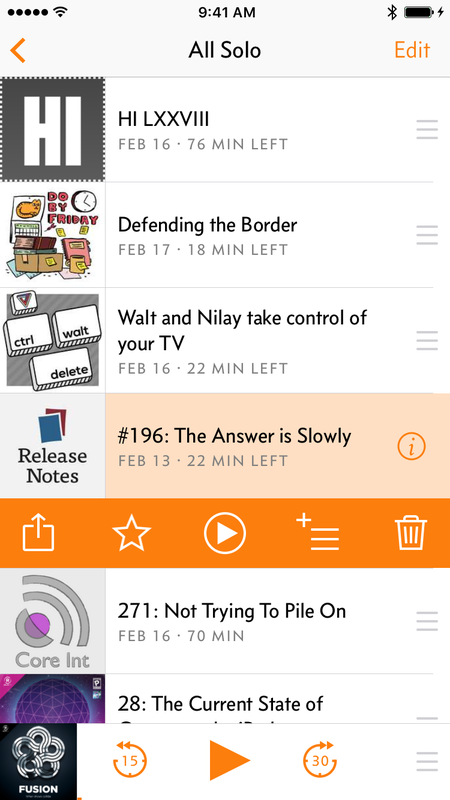 If you already have a playlist named “Queue” or the default “All Episodes”, that’s used, and if not, it’s created as necessary. These show up everywhere and have full functionality just like every other playlist. 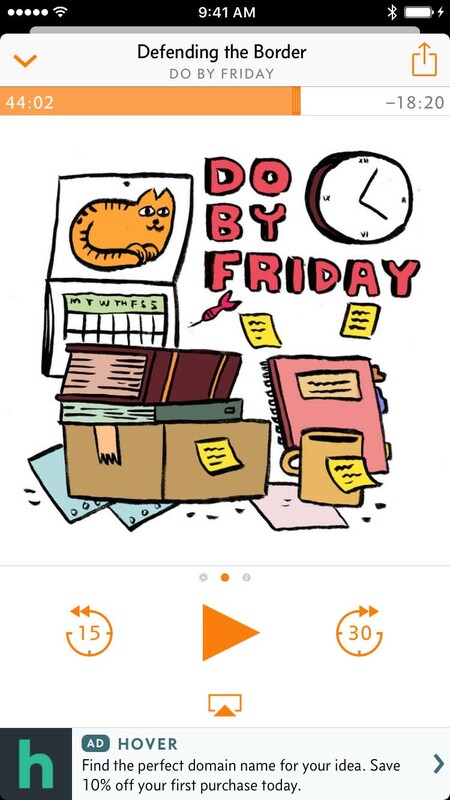 The podcast screen always had a huge design flaw. 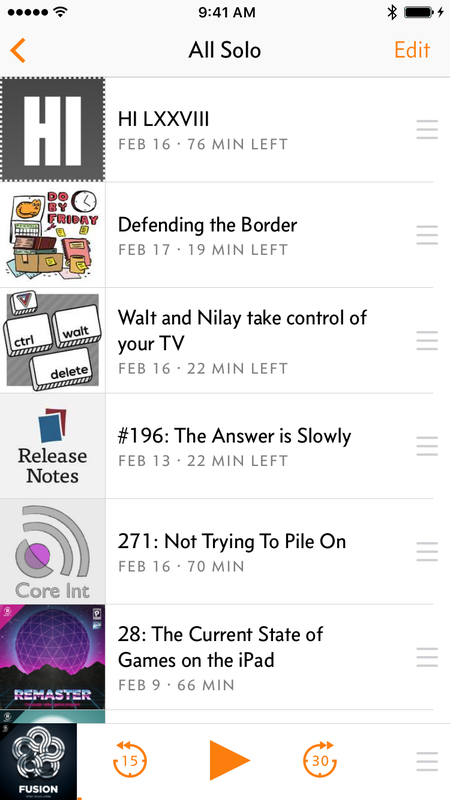 Quick: in the old screen, how do you reverse the sort order of the episodes so it plays oldest to newest? There’s no standard for this on iOS, so I copied the desktop/web standard of a triangle indicator on the header that can be tapped to reverse the direction. 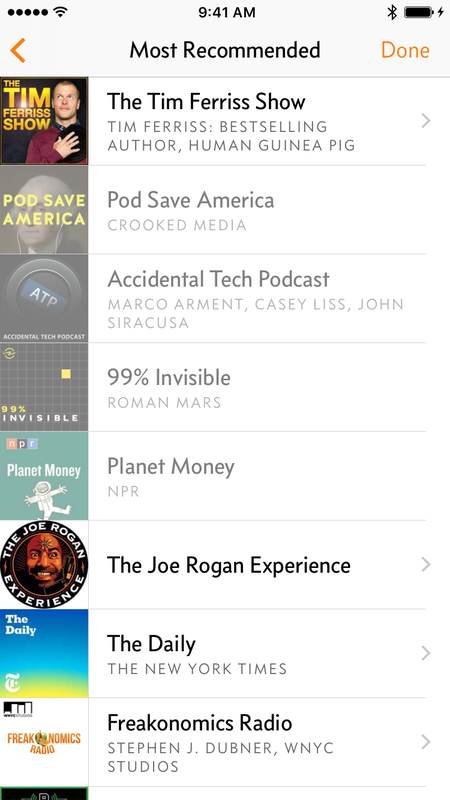 Nobody ever found this, so I’ve added a clearly labeled option under each podcast’s Settings as well. 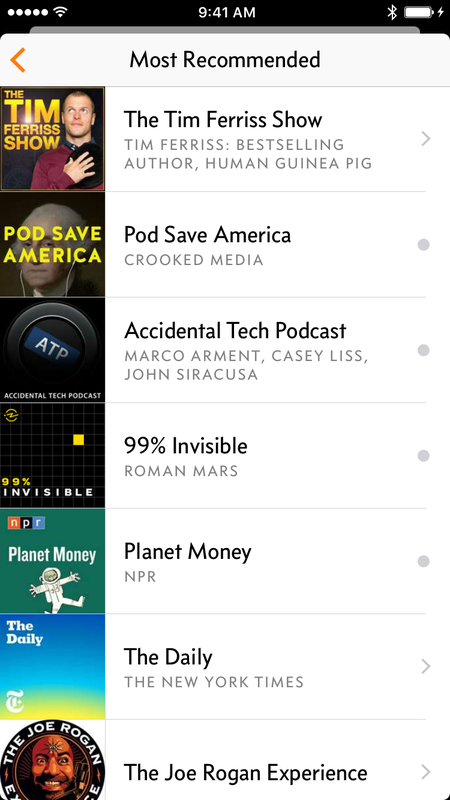 The old podcast-directory screen was filled with annoyances: podcasts you’d already subscribed to would be dimmed out and show an annoying alert if tapped, you could only add one podcast at a time, etc. 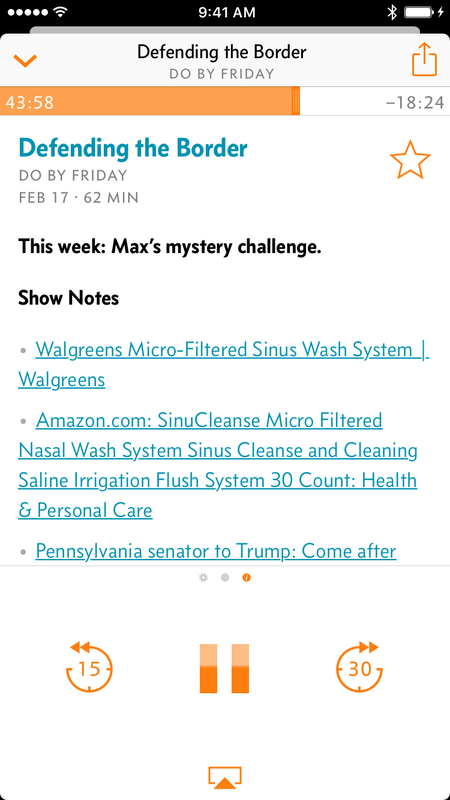 Now, everything’s visible from everywhere, the same actions show up wherever an episode is listed, and you can add multiple podcasts without having to go back into the directory for each one. (Finally.) And, of course, it’s a card, so it’s easy to dismiss by just dragging down. 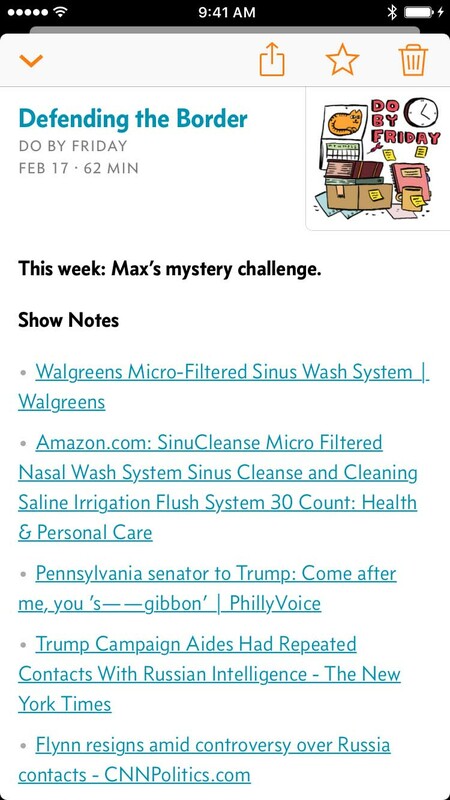 Bad ads: I had little control over the advertisers or the ad content, which could be offensive or reflect badly on my app without my knowledge. I thought I could set adequate limits, but in practice, it wasn’t good enough. Google provides an extensive control panel that lets you block certain ad categories. Most are clearly placed in Sensitive Categories and were easily disabled before launch, like gambling, drugs, etc., but I kept hearing from customers who’d seen other ads that offended both of us. 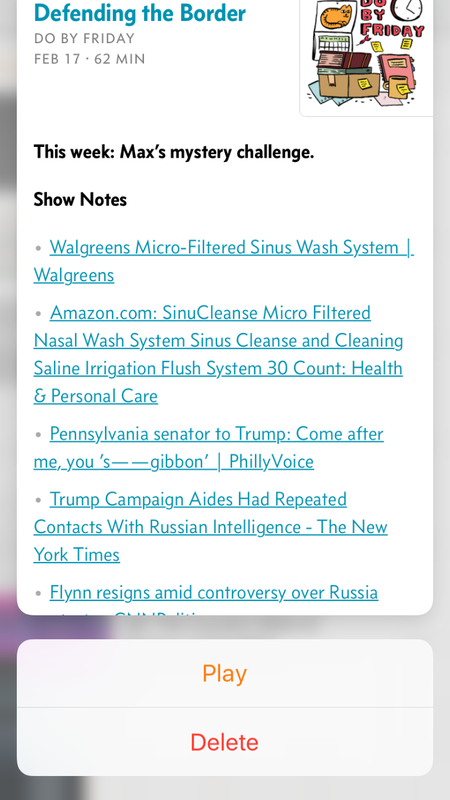 For instance, at least one listener was shown an ad for a gun, which I never even considered would be allowed with all of the “sensitive” categories turned off. But Guns & Firearms isn’t in Sensitive Categories next to drugs and gambling — it’s in Business & Industrial > Security Equipment & Services. So I kept blocking more categories, but it was never enough to result in ads that were consistently acceptable to me. Other ad networks exist, but they tend to be even worse, or they don’t make enough money, or both. Mystery code in my app: I had to embed the closed-source Google ad library into my app, and accept all of its uncomfortable requirements (Advertising Identifier, permission dialogs to use things like Bluetooth or Contacts if an advertiser wanted it, etc.). This made me a little uneasy in September, but then November happened, and by late January, I wasn’t comfortable embedding unnecessary closed-source code from a U.S advertising company in my app anymore. 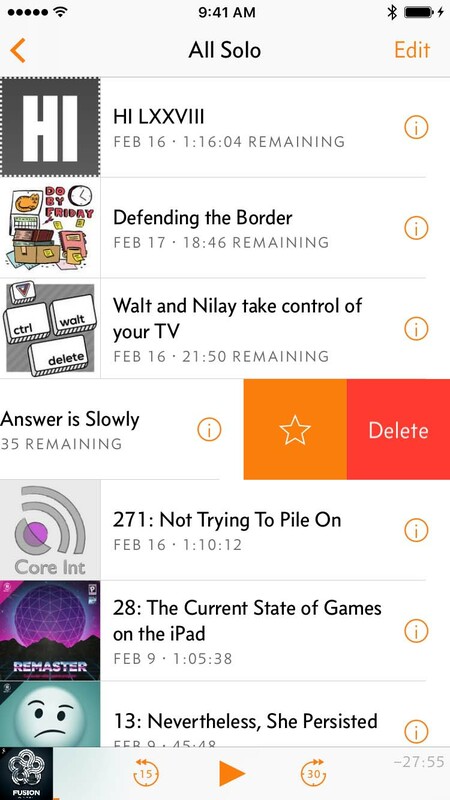 No closed-source code will be embedded in Overcast anymore,4 and I won’t use any more third-party analytics services. I’m fairly confident that Apple has my back if a government pressures them to violate their customers’ rights and privacy, but it’s wise to minimize the number of companies that I’m making that assumption about. 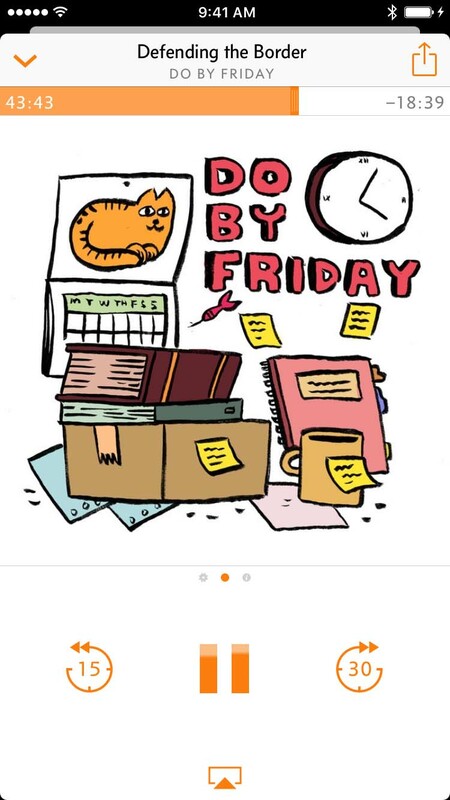 That’s right, ads for podcasts. 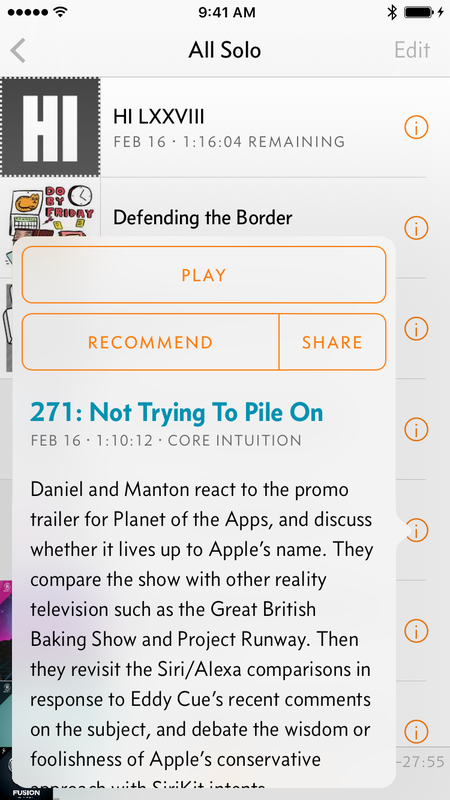 What better place to advertise a podcast successfully than in a podcast player? 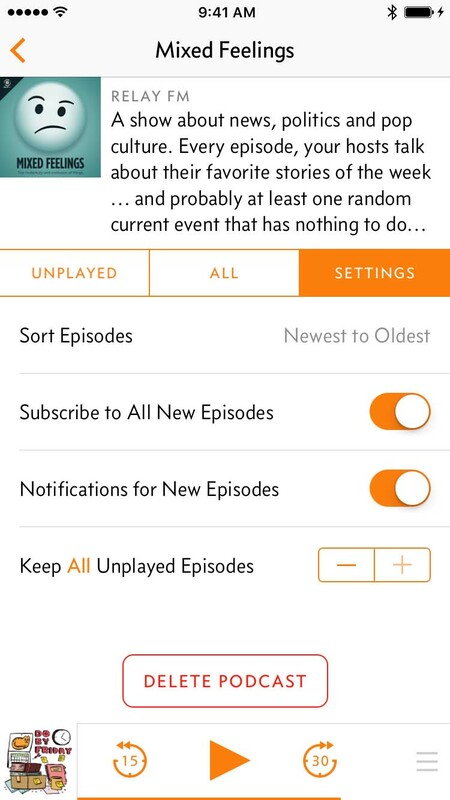 Tap one, and you get the standard Overcast subscription screen with a complete episode list and one-touch subscribing. It’s a huge update. Thank you very much to all of my customers who made this possible. I hope I’ve succeeded in my design goals, and I hope you enjoy it.